One of my greatest simple joys at the moment is our cute little herb garden. Although it was a challenge to get established, it’s finally starting to become productive.That might be because our companion plants like basil and lavendar are growing nicely and their smelliness is discouraging pesky pests. 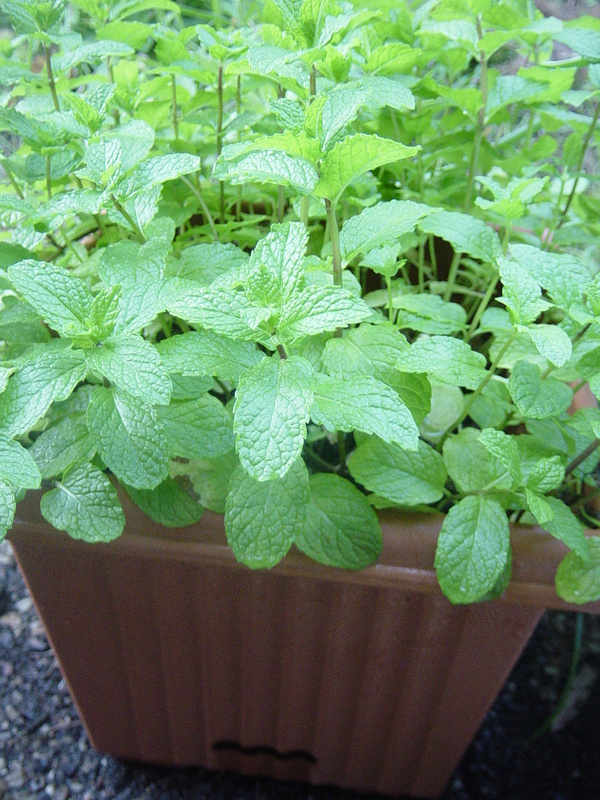 Taking care of these herbs is a sure-fire tonic for keeping the blues at bay. 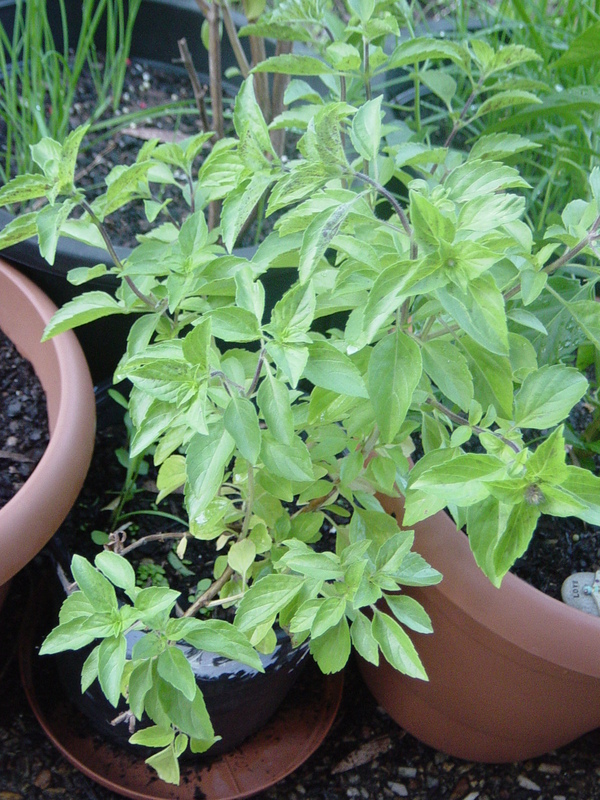 Growing your own herbs is a very simple and satisfying way to save money too. 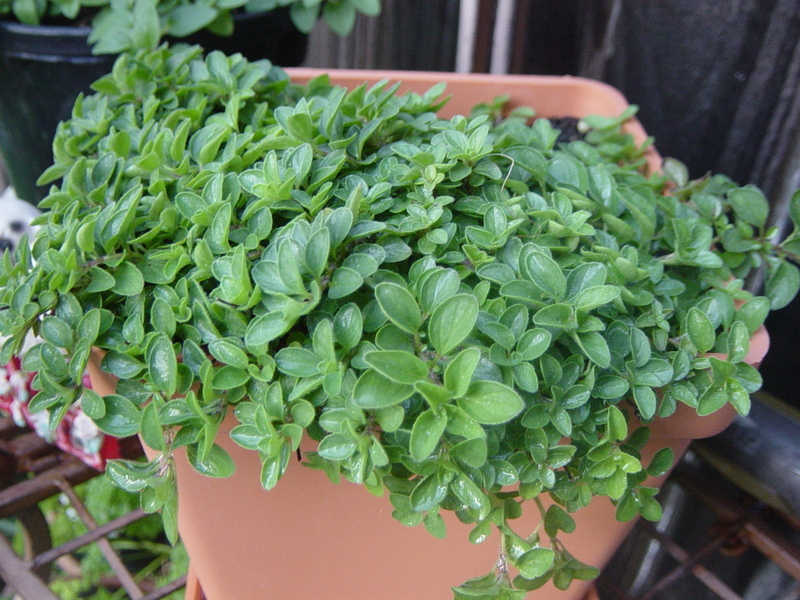 If you love good food, you would know having fresh herbs at hand is always best. 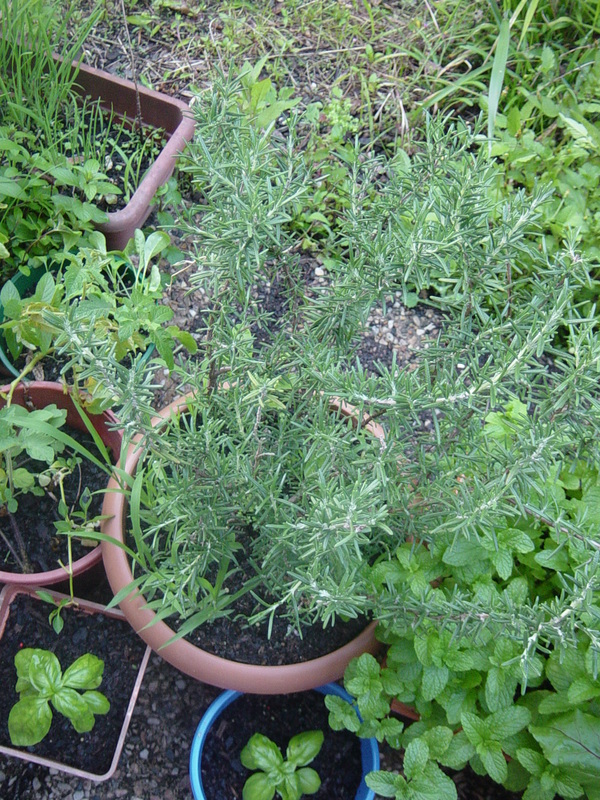 Buying a bunch of herbs from the supermarket is wasteful, expensive and just not as good as growing them in a pot at your back door and taking a sprig or two as you need it. The absolute essential herb as far as I’m concerned, which is the first one we were able to successfully grow and harvest, is parsley. It’s very healthy, versatile and hardy. 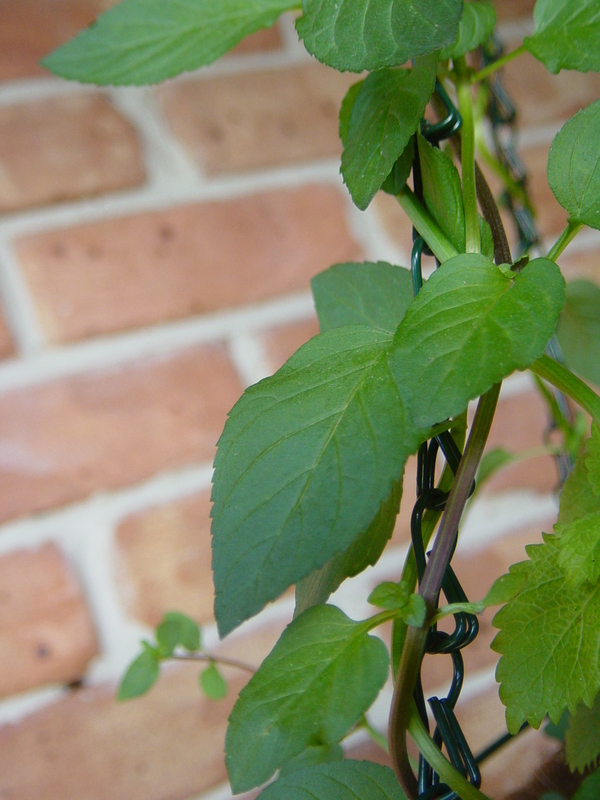 But now we have a bunch of other herbs that are turning out to be real joys, for example, having three types of basil and mint on hand is just wonderful! 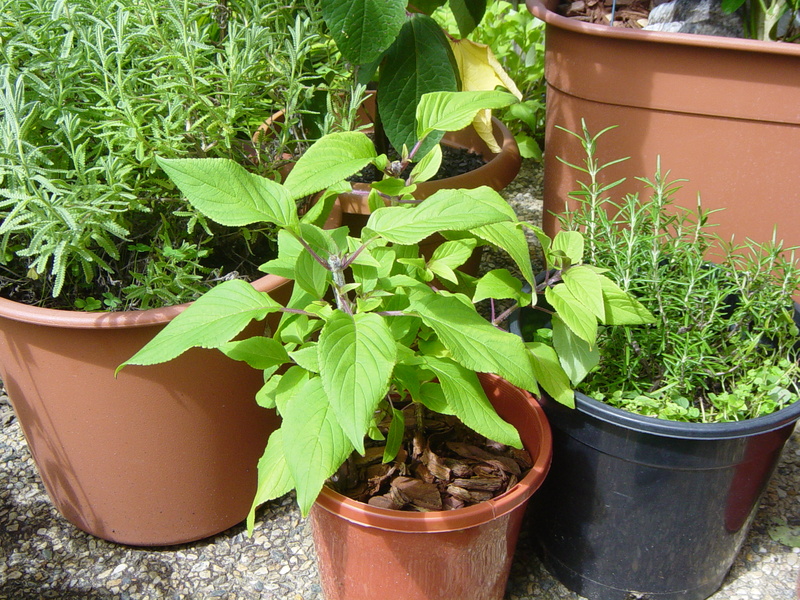 Here is a quick break down of the herbs currently in our potted garden and what they are good for. Many also have traditional ‘magic’ properties too, which I think is nice to just keep in mind, even if you don’t fully believe in that kind of thing. After cross referencing several websites I found common themes amongst them using various words meaning basically the same thing. So I came up with three practical catergories that are meaningful to me. Although its a small thing, our single bunch of mondo grass is in gorgeous bloom at the moment, and it’s something I think can only be truly appreciated close up! 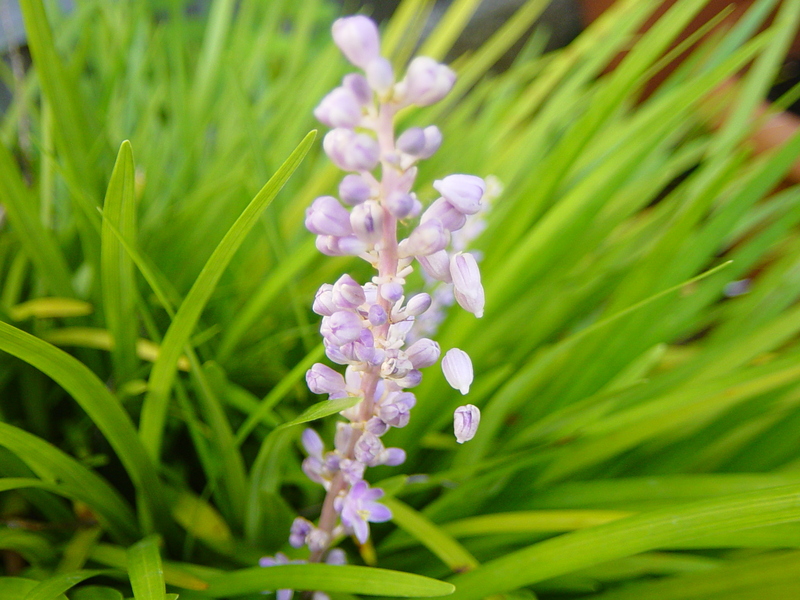 We also have a second clump of miniature mondo grass which is flowering as well. 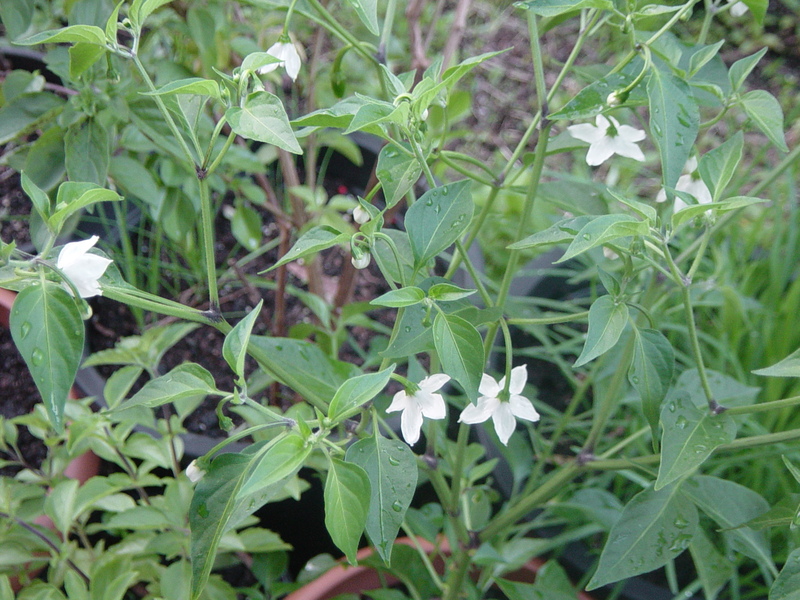 These plants are in the ground and form part of the garden of our rented property. 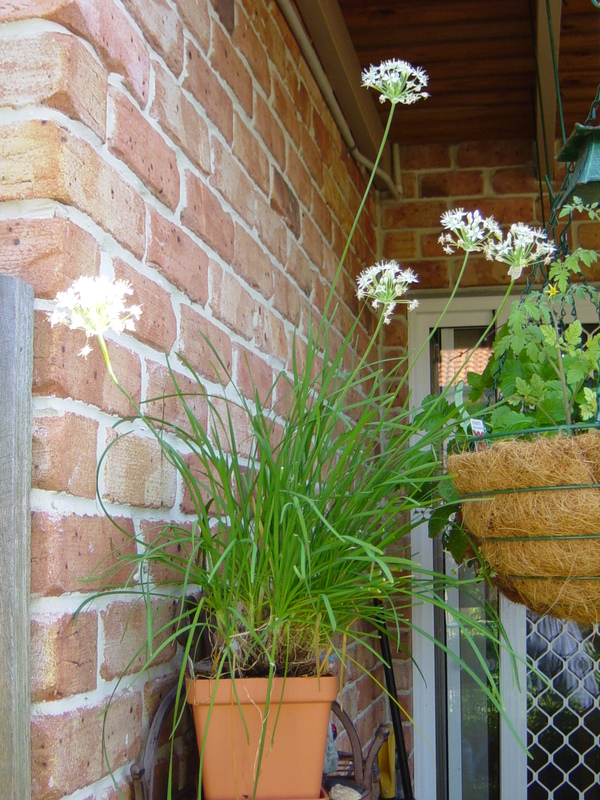 And I can’t forget our garlic chives, who are very happy nowadays and currently in full flower. No seeds as yet though, from what I can see. I checked the internet for images of garlic chives seeds and they will be little black seeds. 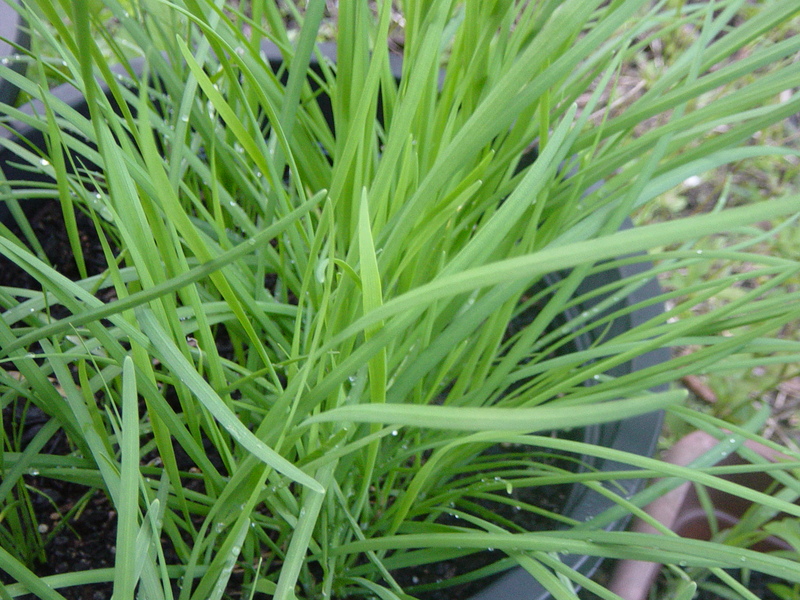 We are eagerly awaiting the arrival of these new babies so we can plant lots more chives for yumminess! 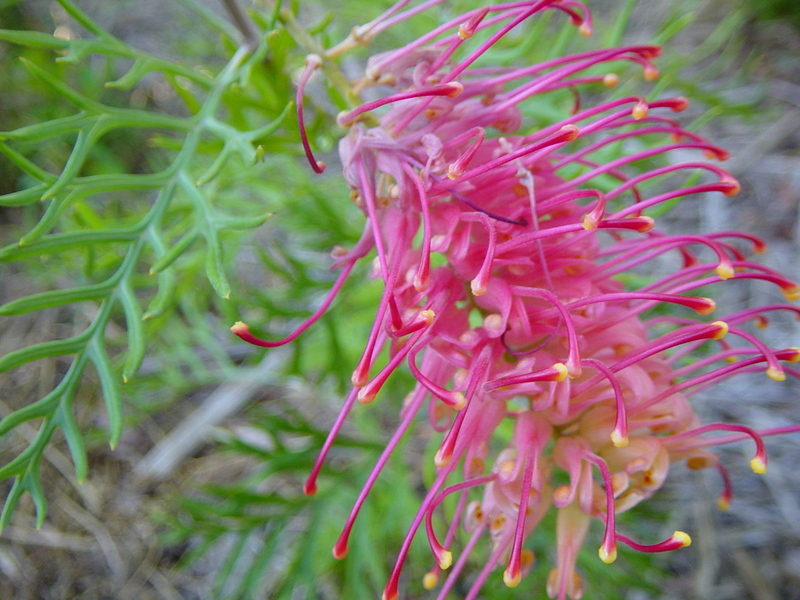 Also, flowering at the moment is the native grevillea the landlord planted some months ago. Nice, and flushed with colour. How flourid. 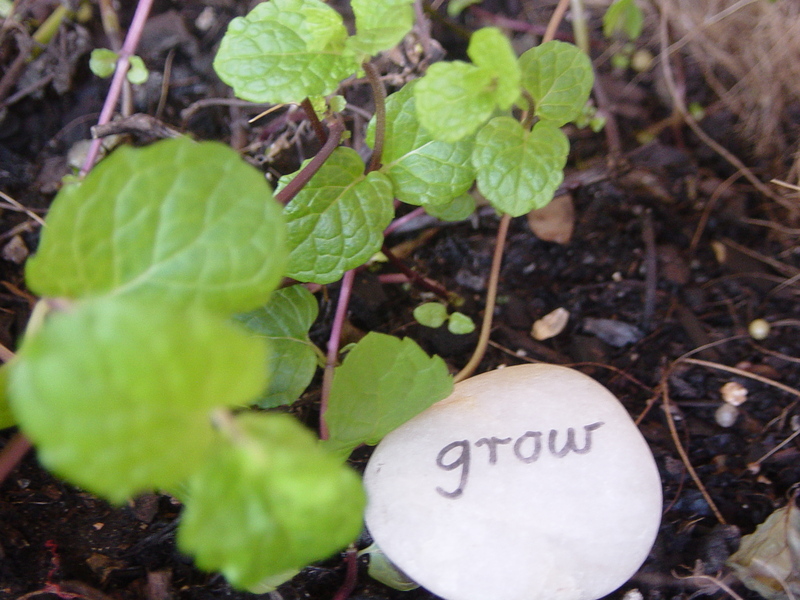 The ritual of placing good luck charms in the garden is a way to remind yourself to do the best you can as it’s caretaker. There is no voodoo or magic involved, other than the magic of self-motivation. 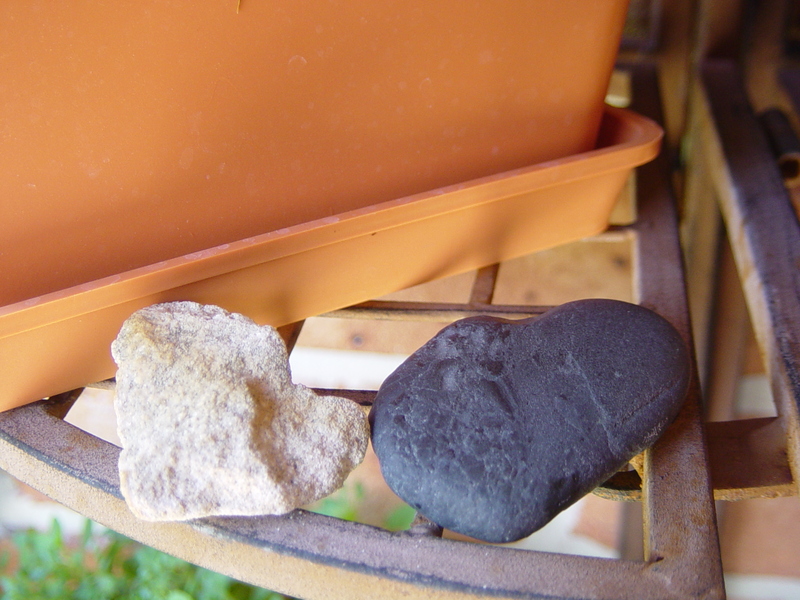 I made up a little ceremony where David and I each chose a pebble from the collection of smooth river rocks sitting with my pony-tail palm. 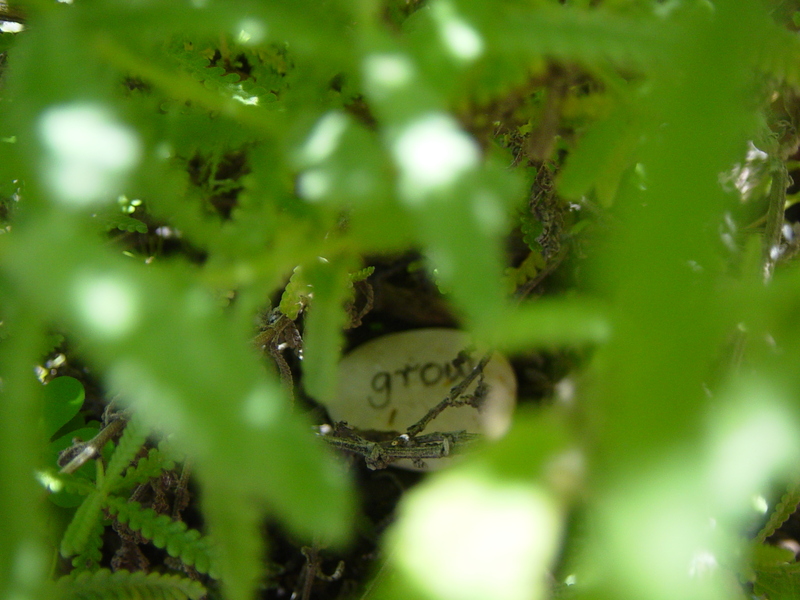 We then gave our pebble a peck and wrote the word ‘grow’ on it with a laundry marker. 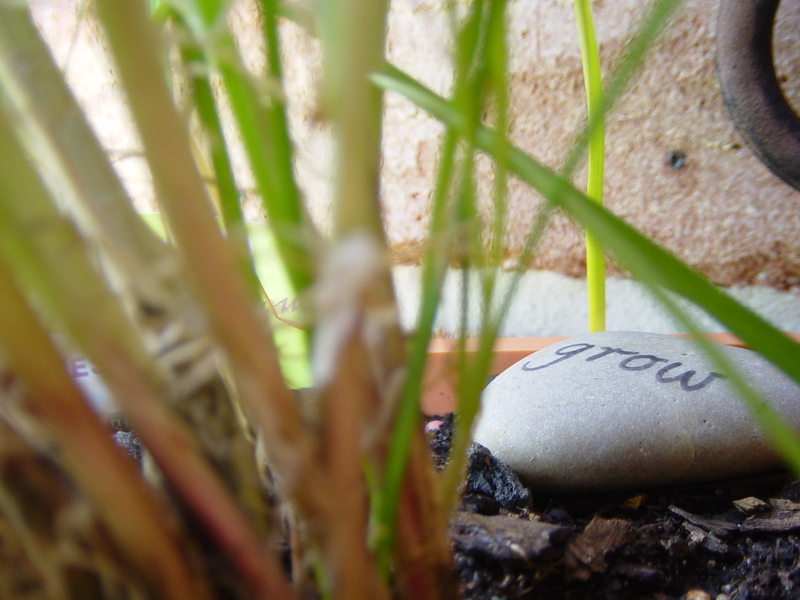 We then chose a plant to pop the pebble under and whispered ‘grow’ as we placed it. There is no witchery behind this, just a little ceremony to help us try hard while looking after our garden and to help us do our best. 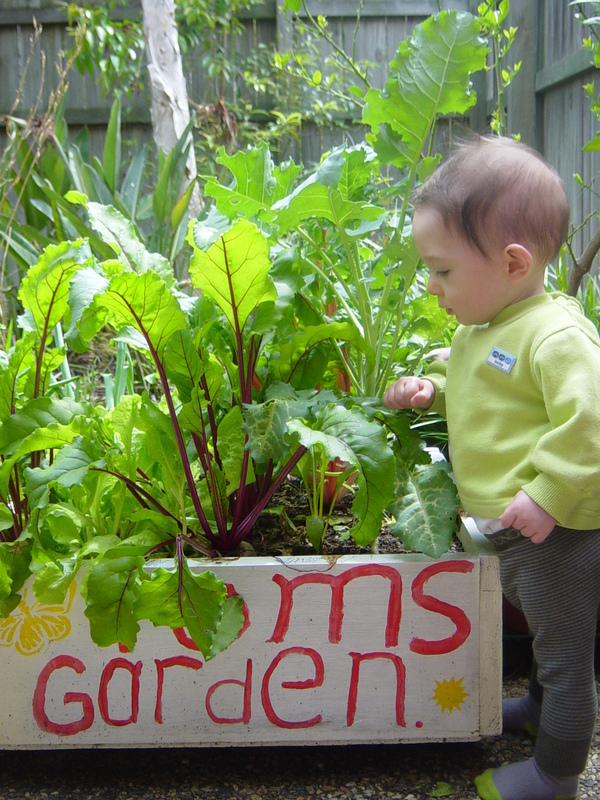 I believe it is a powerful thing indeed to convince the mind to have faith in something such as a little magical help in the garden. This pair of lovey-dovey puppies started off the whole business of me placing lucky love charms. They were a gift from my late grandmother, and at the time I really wondered what I would do with such an impractical gift. I was in an unhappy relationship at the time and the significance of these puppies were lost on me. Now, I’m very grateful they take pride of place in our garden. My granny also gave me a couple of windchimes, one year after the other, perhaps because my response to the first one must have seemed very positive. At the time, I really didn’t know what I was going to do with such things. 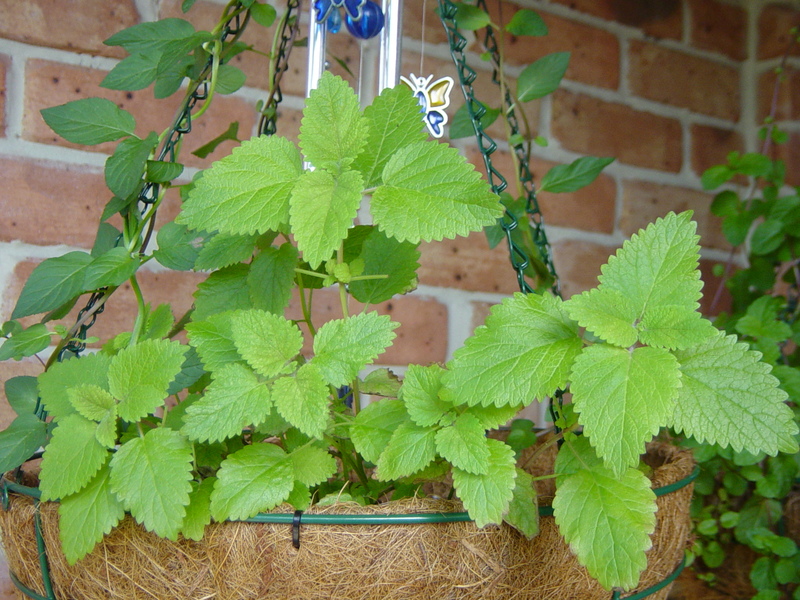 But now one hangs from the pot plant hook with the newly planted peppermint, which looks as if its going to take off, and some lemon balm for herbal tea. Last spring I saw some crows pulling the coconut fibre from our hanging pots, presumably to line their nests. I hoped the sound of the chime as they tugged at the pot would scare them off, and so far it seems to have worked. But perhaps nesting season is over and the real telling will be if they come back next year. The other small and cute windchime hangs on the back sliding door that opens out to the courtyard. A soft pleasant ringing sound nicely reinforces a trip out into the garden before engaging in some pottering. After some recent trips to the beach near David’s mum’s house, we couldn’t help ourselves but to pick up some rocks from the sand that we thought looked like love-hearts! Of course, in some cases you need a good deal of imagination to see it, not unlike being able to see things in clouds. But that is part of the fun! One person insists a rock is shaped like a heart, when for another the connection is dubious. 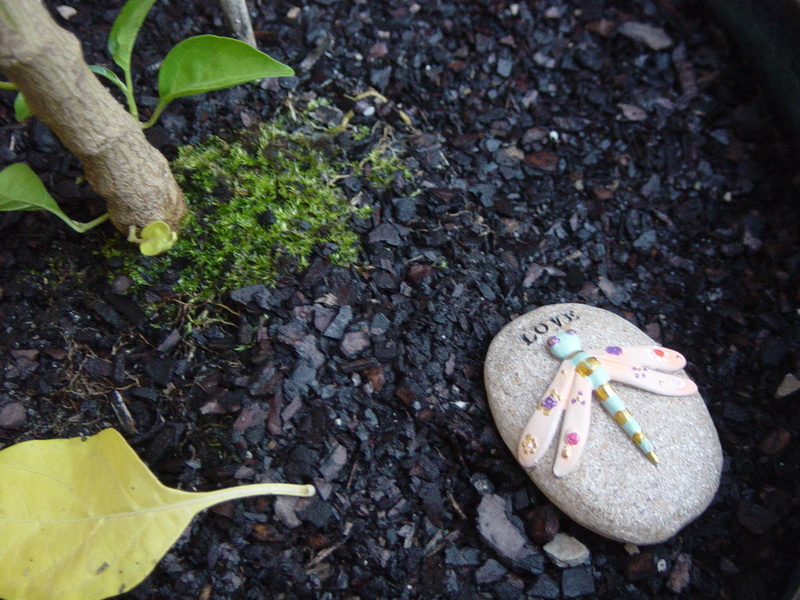 We have a few little rocks placed around our garden, that with some stretch of the imagination resemble love hearts. 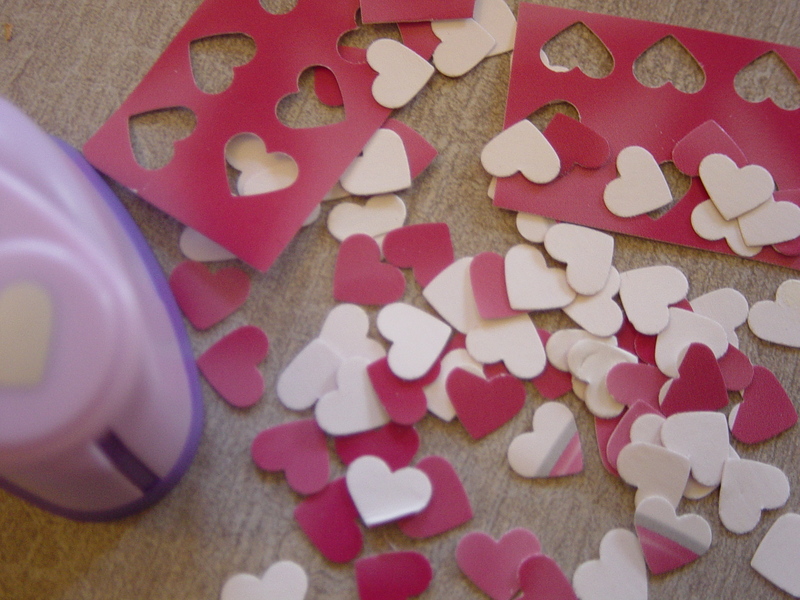 Here are a couple I think look like hearts! We almost never walk into what we call a ‘junk shop’, shops that sell poorly made bric-a-brac cheaply so those on a tight budget can get some retail therapy. 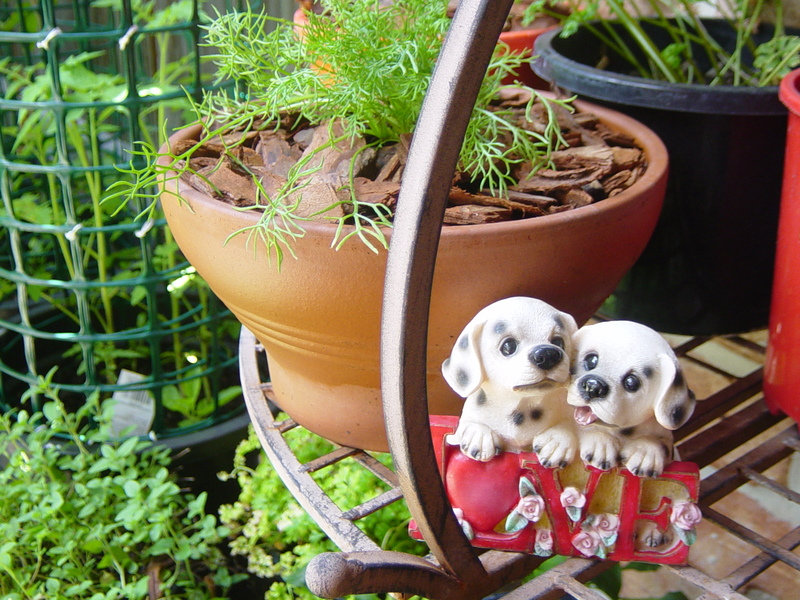 But one day we were on the hunt for ‘lovey-dovey’ stuff to decorate our home, and we found this cute little piece to pop in our garden. I insisted a junk shop would have heaps of lovey-doveyness and I was right! 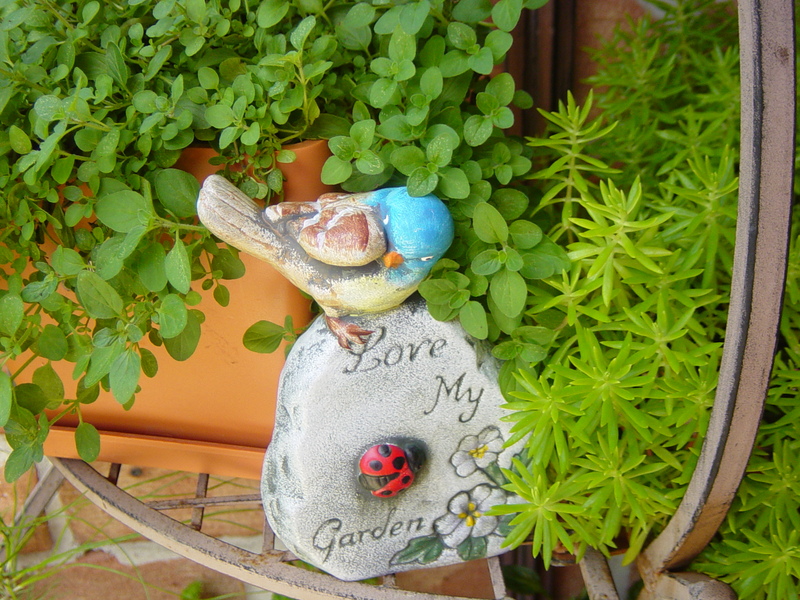 Here are two more examples of lucky love charms in our garden. 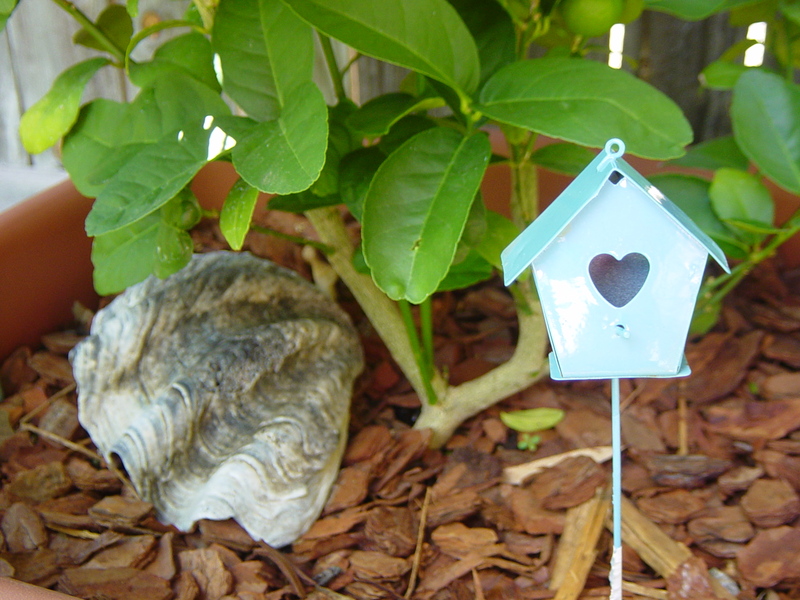 We got the love-heart bird house for $1.79 at Bunnings, it’s so cute! 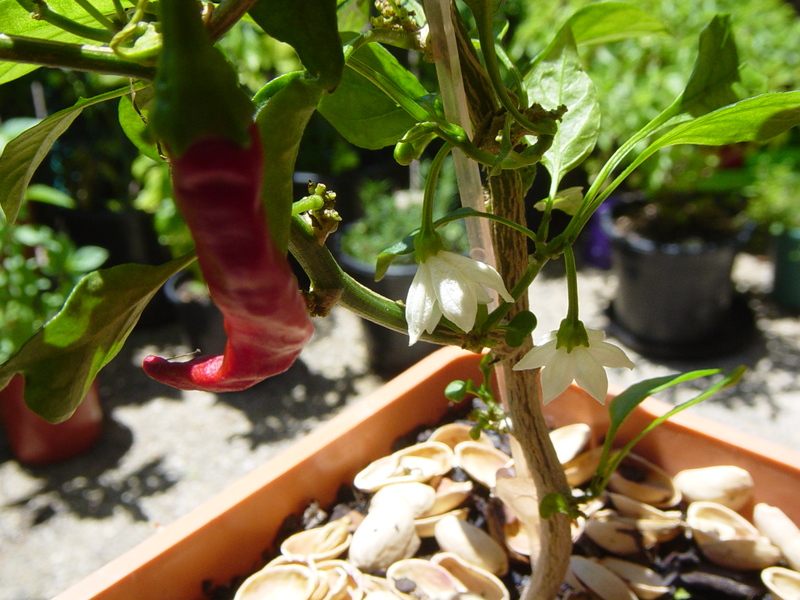 The dragonfly love charm was $2.95 from Turner’s Nursery and sits with our new Thai Chilli plant.